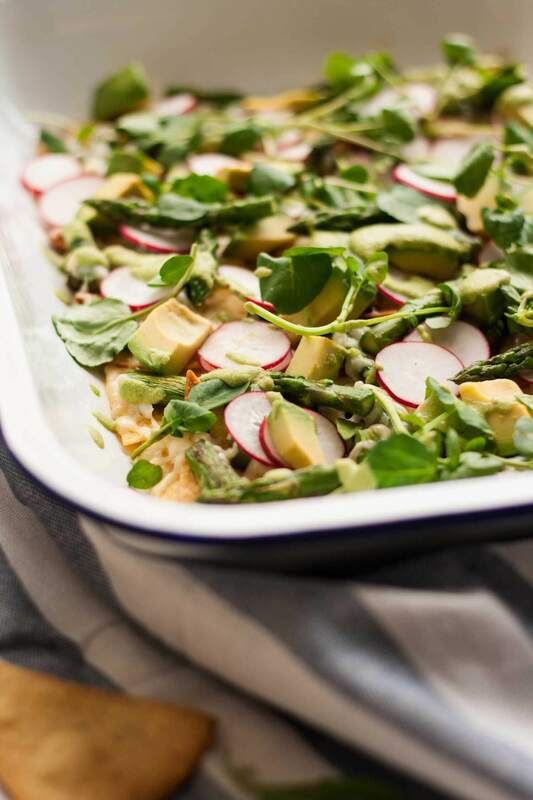 Say hello to your new favourite food: Healthy Asparagus Nachos! Who else out there loves to eat nachos, until immediately after eating them, at which point you regret ever putting them in your mouth? Just me? Gah, I feel like I could eat nachos for every meal whilst I’m eating them, but my body hates me afterwards. That said, my nachos usually consist of a good helping of refried beans, store-bought tortilla chips and way too much sour cream. I know, I know. They’re definitely a treat. Oh, some amazing nachos have come out of my kitchen, let me tell you. Whenever my American brother-in-law comes to visit, our kitchen hosts a Mexican food cooking frenzy. I mean it – vats of guacamole, salsa and refried beans, queso fundido and whole oven trays of nachos – it’s awesome. We once even made a burrito of epic proportions – it was about 4 ft long! (And I ate a tiny sliver of it and the guys dealt with the rest). 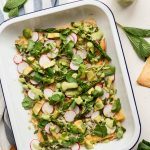 These Healthy Asparagus Nachos are a world away from the grease-laden offerings that you normally associate with nachos. They’re light and fresh and incredibly delicious and most importantly, you feel good after eating them. Like, really good, because you just ate a super tasty meal that was loaded with good stuff (and just a sprinkling of cheese because nachos need cheese!) and you aren’t stuffed to the rafters. How good is that?! 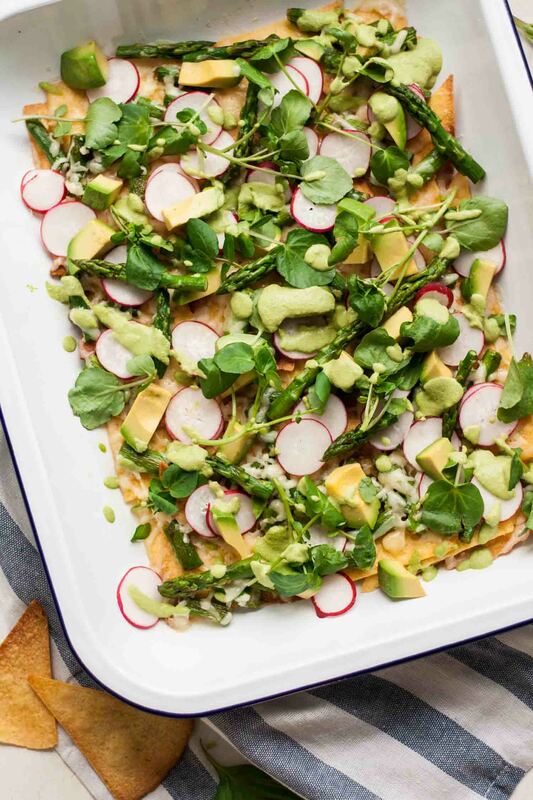 And as promised, these nachos feature that insanely good 5-Minute Vibrant Spring Sauce that I posted on Wednesday. Trust me, you’re going to want to try these! The sauce makes them. So you get your corn tortillas (the best you can find) and chop them up into triangles. Then you rub them with a little oil, sprinkle with salt and bake for about 10-15 minutes until crispy. And that’s the other thing about this recipe. It’s so quick to make! There’s literally no excuse not to make them. Whilst the tortilla chips are baking you quickly sauté off some asparagus and once they come out of the oven you scatter with the asparagus and the cheese, pop them back under the grill for a couple of minutes until it gets all melty and then you adorn with all of the toppings and devour! 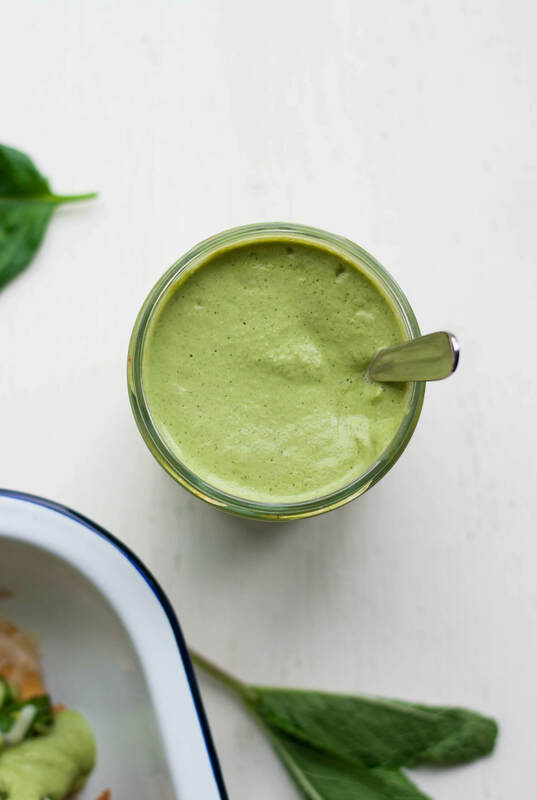 Simple, quick, satisfying and (mostly) healthy! They’re spring in nacho form. Bet you’ve never had that before. Make them this weekend! You’ll have more sauce that you need for these nachos so do the logical thing and make double nachos! I’m kidding, kind of. 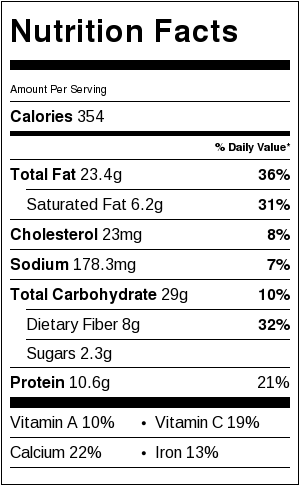 The sauce is great as a regular dip and would make a knockout salad dressing too. 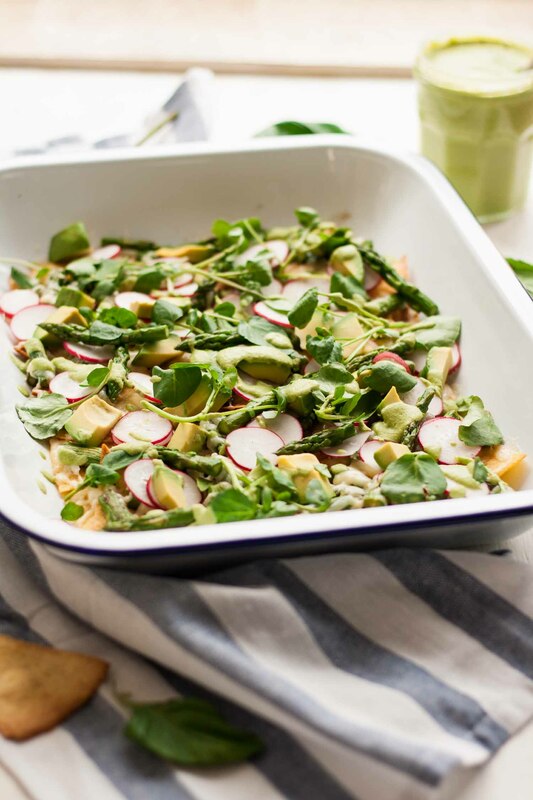 In fact – watercress/radishes/avocado/asparagus – you’ve got yourself a pretty awesome salad right there doused in that sauce. Yum! Preheat the oven to 350ºF. Cut each tortilla into 8 pieces and spread out on a large baking sheet (or two, depending on the size) so that there is minimal overlap. Drizzle with 1 tablespoon oil and distribute evenly with your hands so that each chip is lightly coated. Sprinkle with salt to taste and place in the oven for 10-15 minutes, until crisp and golden. Switch the oven to grill once the tortilla chips are ready. Whilst the tortilla chips are cooking prepare the toppings. Snap the woody ends from the asparagus spears and chop into 1 inch pieces. Heat the remaining oil in a frying pan and add the asparagus pieces along with a pinch of salt and pepper. Sauté for 3-5 minutes, depending on the thickness of the spears, until tender and golden. Finely slice the radishes and dice the avocado. 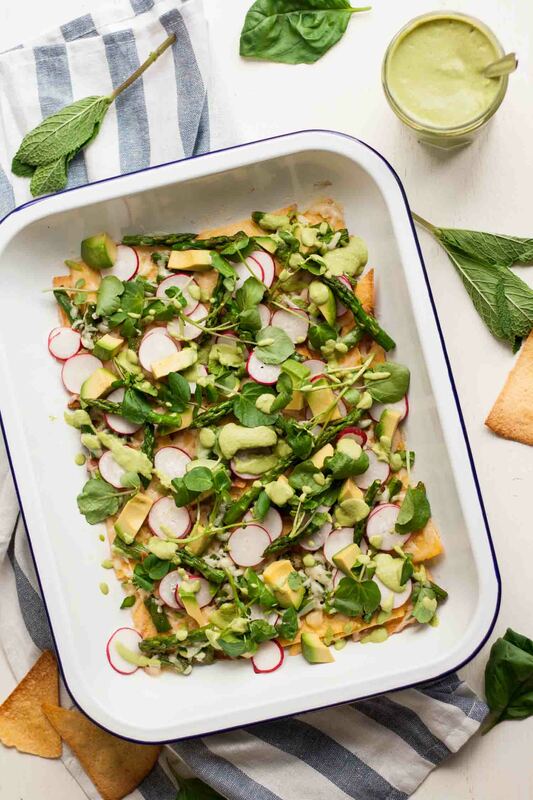 Once the tortilla chips are crisp and golden, scatter with the asparagus pieces. Evenly distribute the cheese over the top and grill for 2-3 minutes until the cheese is melted. To serve, sprinkle with the sliced radishes, diced avocado and a handful of watercress or pea shoots. Drizzle generously with the sauce and dig in! That is a beautiful, great idea! Those nachos look yummy and healthy at the same time. Love that you baked your own tortillas, and that sauce is unbelievable! Thanks Nicoletta! Making your own tortillas really does make such a difference! And the sauce takes it over the top! Really great idea Sasha! That sauce sounds amazing! Thanks Michelle! 🙂 gotta love nachos! I love Nachos, I love asparagus, I love cheese and I love any sauce that’s green…. what a great idea!